Norwegian is proud to announce that Irish poet and playwright Oscar Wilde will become its second Irish ‘tail fin hero’, ahead of the anniversary of his birthday on the 16th October. 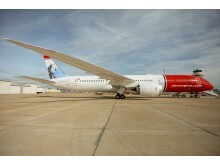 The renowned writer’s portrait graces the tail fin of two Norwegian aircraft – a Boeing 737 MAX and a Boeing 787 Dreamliner. 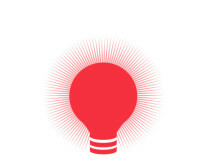 Since Norwegian’s first aircraft took to the skies, the airline has always honoured iconic figures on the tails of its aircraft, featuring personalities who symbolise the spirit of Norwegian by pushing boundaries, challenging the norm and inspiring others. 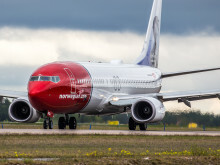 To represent Norwegian’s growth in Ireland, the airline has launched a second Irish tail fin hero following the announcement of explorer Tom Crean who also graces a Boeing 737 MAX and a Boeing 787 Dreamliner aircraft. Born in Dublin on 16 October 1854, Oscar Wilde was a renowned Irish poet and playwright. He tried his hand at various literary activities throughout the 1880s and became one of London’s most popular playwrights. His imaginative works, in particular, his novel The Picture of Dorian Gray and his play The Importance of Being Earnest, are considered among the great literary masterpieces of the late Victorian period. 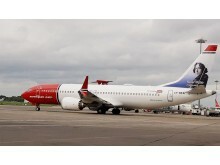 Norwegian is Europe’s third largest low-cost carrier, carrying over 33 million yearly passengers to around 150 global destinations. Norwegian has been named ‘World’s Best Low-Cost Long-Haul Airline’ for the fourth consecutive year and ‘Best Low-Cost Airline in Europe’ for the sixth year in a row at the renowned Skytrax World Airline Awards.